POLL: How Do You Feel About Sammy Sosa? The Cubs held the 100th anniversary ceremony for Wrigley Field today, and while plenty of former Cubs greats — and Ryan Dempster — as well as former Bears greats were on hand, there was one Cubs player noticeably absent. 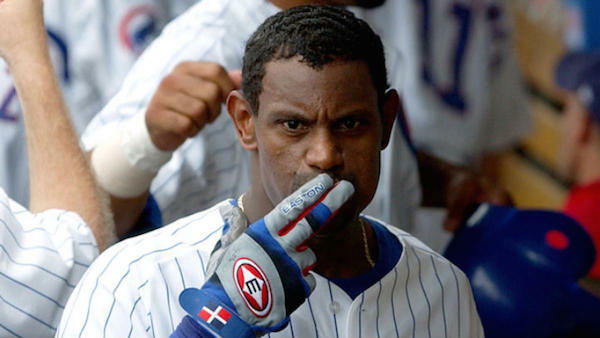 A follower on Twitter suggested the Cubs stayed away from Sosa because they worried fans in attendance would have booed him. And that got me wondering. I know how I’d react were I a Cubs fan at Wrigley with Sammy Sosa there, but how would you? This entry was posted in Chicago Cubs and tagged Polls, Sammy Sosa by Tom Fornelli. Bookmark the permalink.